¡Si se puede! I exclaimed when I saw the dough the morning after grinding it. It had risen. At last I could report to the naysayers, who thought that whole ragi and whole urad couldn’t be trusted to make a good idli, oh yes they can! [Background] I searched through a number of recipes online and not one used both whole ragi and whole urad. 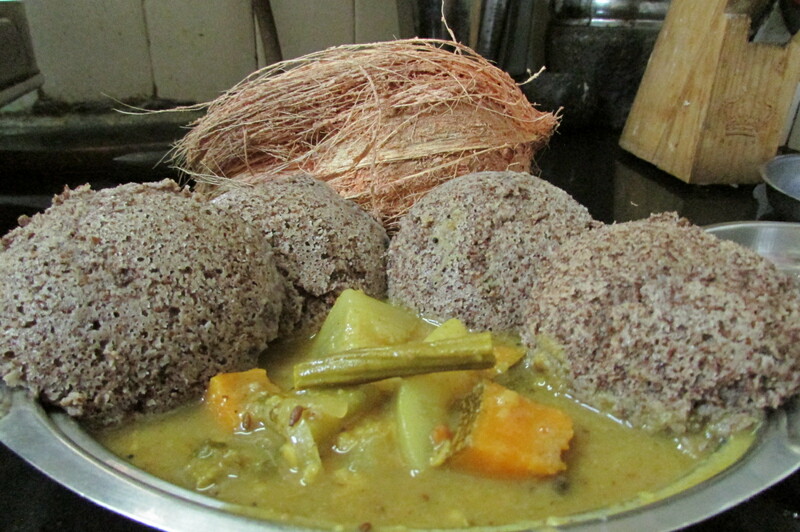 In fact, other than what I have posted, I haven’t seen any idli recipe featuring whole grains. Even those who venture into coarse grains, namely millets, often use the white versions, in whole or milled form. Even when they use the whole grain millets, many add white rice or white poha, and white urad. When will we ever get over the obsession with whiteness?? Brown and red rice, deep red finger millet, black gram (urad), green gram (mung) all lend such rich earthy colors to the batter and with those colors come a variety of nutrients. More importantly, the husks are a source of fiber and those prebiotics that you may be hearing about these days, as we are led to learn all kinds of high-falutin’ names like oligosaccharides for the nutrients we used to get unwittingly when whole grains were naturally part of our diet. Get it – I said take one and she wanted to take two! Seriously, though, time for Take 2. No rice, no other millet, just finger millet and black gram. Would it work? Would the ragi be too coarse? Well what was the worst thing that could happen? If it didn’t rise, I could still try making dosas, which tend to work even when idlis don’t, or I could refrigerate the whole batch, grind some other millet or rice and stir it in later and let it all rise some more. Thus emboldened, I soaked my grains. Ragi (finger millet) has soaked for 6 hours. KHIYALI says: We saw a YouTube ragi idli recipe which used peeled black gram and called it… white gram. And guess how many idlis that recipe made. 12? No. 24? No. 8? Getting closer…. 4??!!! Yes!!! I mean, come on. If you’re going to do all that soaking and fermenting and steaming, why in the universe would you just make four? Recipe for Ragi Idli or Dosa Batter made from Whole Ragi and Whole Urad, from Scratch, (not from flour) no White / Refined Grains, and enough to Feed a Small Family. Grind in a blender, mixie, or wet grinder. Soaked ragi (finger millet) and urad (black gram) are whirring under the stones of the wet grinder. Above: Pictures of the grains getting ground into batter. Their black and red skins blend with their creamy interior into a rich earthy grey color. 3. Allow to rise at least 8 hours or overnight. 4. Add salt and stir well. For idlis: pour into oiled idli pans and steam for 20 minutes on high heat. Allow to cool 20 minutes before removing. Ragi Idli batter is ready to go into the idli plates. Idli plates are loaded with ragi + urad batter and are ready to steam. Ragi Idlis are steamed and ready to eat. For dosa: dilute the batter slightly and pour onto a hot, oiled griddle, spreading the dough evenly. Cover. Flip after first side is done and let second side cook well. You do not need to re-oil the griddle after each dosa, though you might find it helpful for the first one or two. Dosa made of ragi (finger millet) and urad (black gram). I usually cook each side for 2 minutes on medium-high flame, but this will vary according to how thickly or thinly you spread the dosa batter. Yield: 20 idlis plus 6 dosas. Could also make 24-28 idlis or a similar number of dosas.